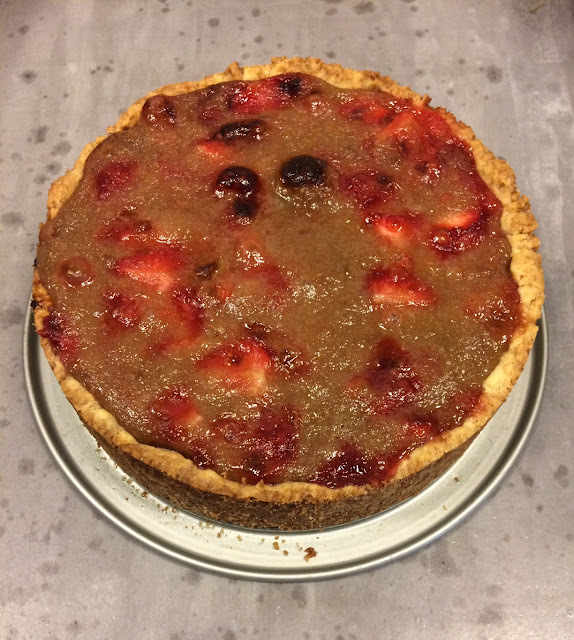 I've been looking for fresh rhubarb for a couple of weeks now to make the Rhubarb Upside Down Cake recipe, but I gave up. I only found it once this year and that was it. For some reason, maybe too expensive, maybe nobody else but me buys rhubarb nowadays, but no supermarket in this town sells it. So in the end I made you an alternative recipe that I used on my other blog a couple of weeks ago. Instead of fresh rhubarb I used rhubarb compote from a jar. The compote doesn't give the beautiful pink color like the fresh rhubarb does, but the taste was excellent! Next week I would like to make Pesto Pasta. 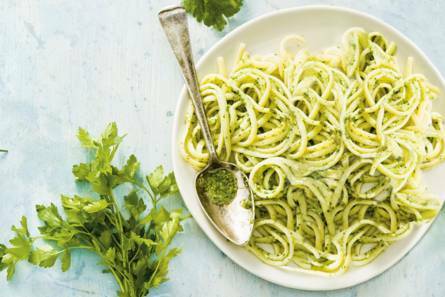 Seems like a rather simple and really fast prepared meal. Funny, I just found rhubarb in the store this week and thought it was really late in the season, but I bought some. Oh yum!!! I will be over for the pie AND the pasta! Thanks so much for sharing with us at the Whimsical Wednesdays Link Party! I love to hear your comments! Thank you for telling what you think! If you have younger kids, chances are high you know the movie 'How To Train Your Dragon'. My youngest daugher is nine and she talks about one Toothless almost the whole day through. Toothless is a dragen, without teeth apparantly, and has the lead role in the before mentioned movie. I must say: he's an adoreble little dragon; black, with green eyes, and cute little wings. And he can spit fire. 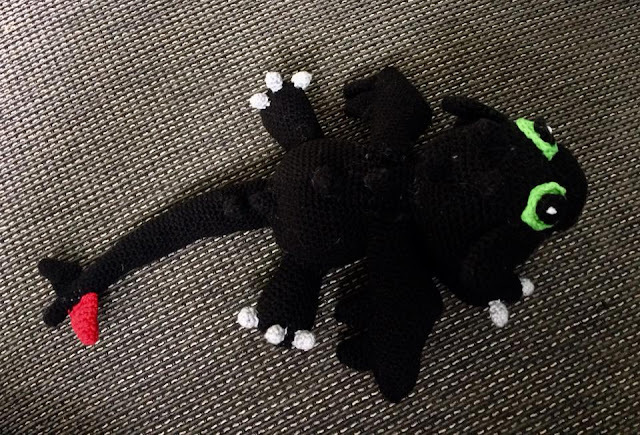 As a surprise I bought a crochet pattern of Toothless to make for my daughter. The Little Llama that I made a couple of weeks ago is featured by Ginx Crafts! 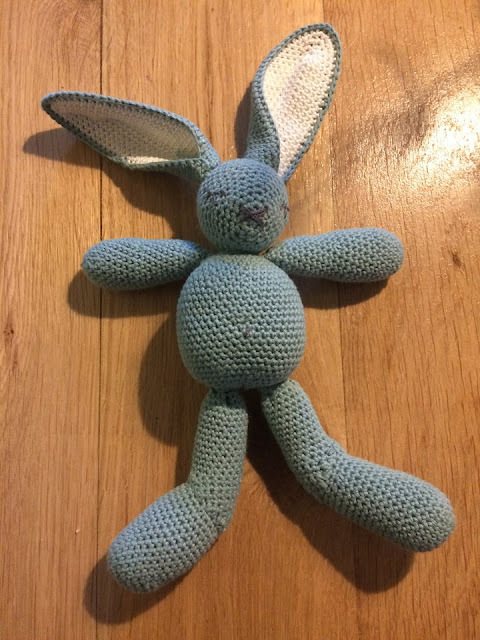 Not the first bunny, because I already made a bunny as a baby present, but this one is for the Easter table. But as you all know, since we have a bunny ourselves (a Flemish Giant weighing 9 kilograms, so he counts for ten bunnies, actually) I love bunnies, so I can't get enough of creating them. Here he is, the Giant of Flanders. Don't worry, he's still alive, just relaxing. Toothless, from How To Train Your Dragon, that I made for my daughter, was featured by Creative Jewish Mom! Three months ago my daughter had her ninth Birthday and we still didn't have her party for class mates. Last weekend she asked if she could celebrate this weekend. A bit of a short notice, but since there's another two week school vacation coming up (again), I couldn't postpone. So, this weekend we had a party. 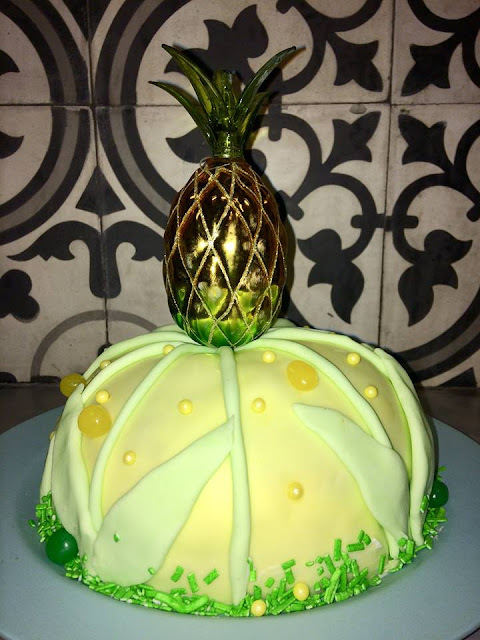 My daughter wanted a pineapple cake (just the look, not the taste), so I made this one. For some reason every plant that I ever bought in my life, ended up dead after just a couple of weeks. Time and time again I bought a plant every now and then, to see if my vibrations, or aura, or spirit companions, or whatever had a better outcome on a new plant in my house and I'm very happy to say that since about six months such is the case! Not all plants, I must say (the ficus for example still hasn't a long life when it lives in my house, and I really don't know why), but most of them stay alive, and not only that, they grow! In the town I live is the most adorable little plant shop, with all kinds of special plants and exotic flowers. Sometimes I just find that I deserve new plants, because apparantly I take such good care of them lately, so yesterday I went in and bought three new ones. Because the window sills are full, I had to change to hanging plants, and besides those two I bought a little terrarium. 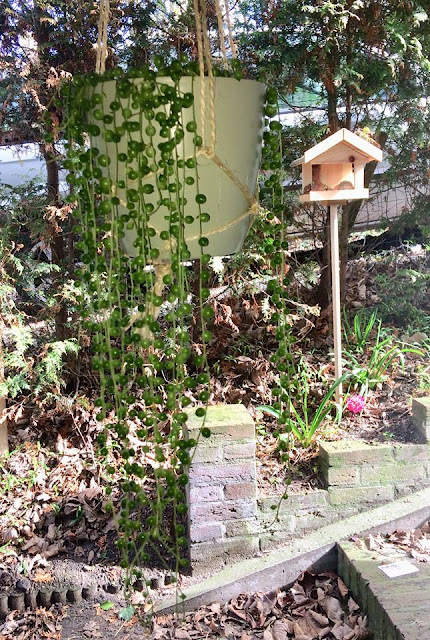 For the hanging plants I made hangers myself by rope. Last weekend we celebrated my youngest daughter's birthday for family and friends and this week her own friends from school will come over for a little party. 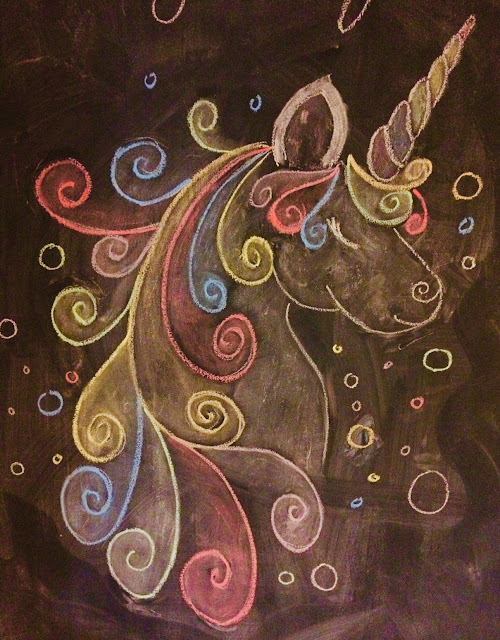 As told it's unicorns all over this year and because most of the festivities will take place in the kitchen, I tried my best to draw a nice unicorn on the black board that we have on the kitchen door. My Unicorn Pinata, also made for the party, is featured by Scrapality and Creative Jewish Mom this week!